Why did I choose to self-publish? How can I start a career in writing? How has technology affected the relation between speech and writing? A Comparative Analysis of the Mind Styles created for the fictional characters Nick and Amy Dunne in the bestselling novel, Gone Girl. Overuse of the exclamation mark: You’re having a laugh!!!! A little strict?!! Leicester City are the Barclays Premier League Champions of 2015/2016, but who will do it next season? 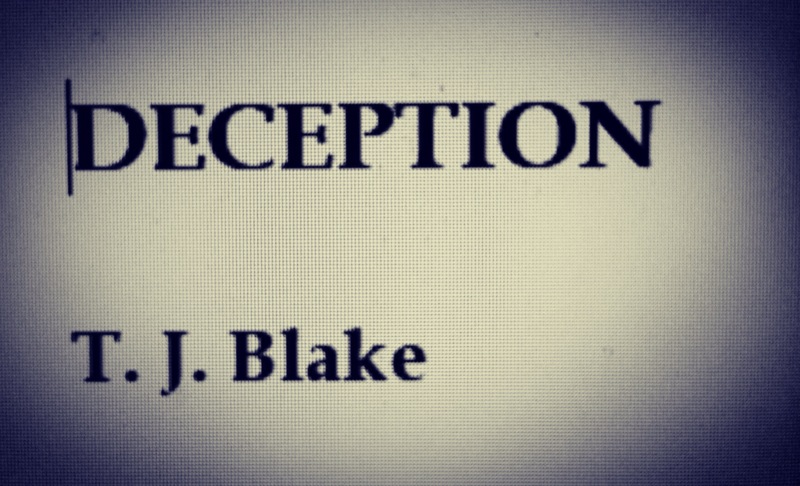 British writer T. J. Blake is the author of the five star psychological thriller, DECEPTION: A Love of Lies. I thought I would let you all know that I have now added another Creative Writing piece to my sparkly new Creative Writing page. This new entry is a short story of mine, which was previously called The Metaphorical Truth, now called Illusory Waters. I changed the name simply because Illusory Waters is much more appropriate, and I think it sounds much better! If you have a spare five minutes, then please, have a read of my new short story Illusory Waters. In my latest article ‘How has technology affected the relation between speech and writing?‘ I cover a number of topics; technology, smartphones, social media, instant messaging, speech and writing. The article primarily focuses on technology’s impact on our written and spoken communication; therefore looking at how the internet, various technological devices, texting and instant messaging has impacted our communicative approach. Do you agree with Mr Humphreys? Continue to my article, see my opinion and feel free to express your own. What have I been doing with all of my Saturday morning? Well I’m feeling a bit ill, so I thought why not stay in and do some work on my blog; before knuckling down to write some more of DECEPTION. So, what have I done? Well, I came across a piece of work which I wrote in my first year of university. At the time I think I received a 2:1, but reading back I’m not sure how I got such a good mark! Anyway, I went through it, made a couple of changes and now it’s available to read on my blog as an article. This brings me onto my first change to the blog, my new page – the’Articles‘ page – where I can now upload articles I write or find lurking within my computer. You’re probably wondering what my article is about? It’s about how technological development has impacted our language. The article covers a basic overview of how technology has adapted, as well as looking into how it has changed people’s writing and speaking capabilities, or has it? – How has technology affected the relation between speech and writing? I’ve also created a ‘Creative Writing‘ page, which basically merges most of my creative pieces together. These pieces currently include my Flash Fiction, ‘Poem Attempts’ and Short Story Nightmare. On this Creative Writing page, I have added something pretty nifty. Everyone loves a poll (I know I certainly do) and when we see one on a website, it’s hard not to vote, right? This is why I have created a poll for my Creative Writing page. By going to this page and scrolling to the bottom, you can find the poll and place a vote! It’s a basic question, it’s not political and it isn’t going to impact anyone’s life, but I would like to know which of my Creative Writing pieces you enjoyed most. Those are my two major changes to the T. J. Blake #Author blog, feel free to have a nose! Just a quick one from me! Getting closer to completing the first draft of my thriller DECEPTION! Can’t wait to get into the editing to fine tune this beast of a book. I’m excited about it, I hope you will be too! At the moment I’m reading an addictive book called ‘Disclaimer’ by Renee Knight – it’s great. For a long time I’ve been hungry for a book that constantly has me predicting, has me wondering (even when I’m not reading) and more importantly keeps me hooked. If this is what you desire from a book, then get your hands on a copy of Renee Knight’s Disclaimer! If you’re dying to find out more, than below is the blurb for Disclaimer. With some great story telling from Knight, the book immediately hooks you in and introduces you to the main character, Catherine, and into her personal life – a lot of stress, a deep secret and of course, the mysterious book. With so much hunger to discover Catherine’s secret and the identity of the book placer, you just find yourself wrapped up in the book; hungry for answers. I struggle to stop reading Disclaimer at the moment and I’m not far from the end. I cannot wait to finish it hopefully over the weekend! A great part (for me personally) of reading Disclaimer is that it shares a similar theme and main plot to my own novel ‘The Author‘ – allowing me to see how Renee tells a story using a book as one of the key aspects of the plot. As a side note, I have also been working on my new thriller ‘DECEPTION’ – why am I mentioning this in a post about Disclaimer? Well, because DECEPTION is currently the same size as Disclaimer (367 pages), everyone loves a fun fact! I’m so close to the end of writing DECEPTION, before I then begin the editing process. ‘My adventure into writing began back when I was just seven years old. The set up would be in the dining room with me and my brother at the dining room table. He would be drawing wars and dinosaurs whilst I would be there writing stories. You can find out more about my journey into writing and self-publishing by having a read of my new ‘About‘ page. I have just posted a 4 star review of Silent Victim by Caroline Mitchell. “The differing perspectives in which the story is told. This is what made this book stand out.” Read the full review on my T. J. Blake #Author blog. Writers are ‘losing control’ over their characters. But is this really possible? 2019 and ‘DECEPTION’ is still receiving 5 star reviews!